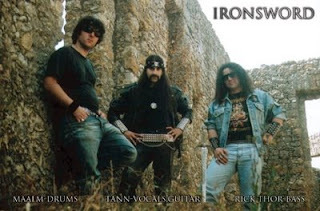 Back when power Metal was not actually the ‘thing’ in the general underground extreme Metal scene, there’s Ironsword from Portugal brandishing some serious Lusitanian Power Metal Thunder with their debut promo- tape in ’95. Evolving into a full line-up band nowadays, and have released three albums so far, the quest of Tann is continuing, not to forget that he’s a seasoned person in the Portugal underground scene, having played in bands like Moonspell, Alastor, Filii Nigrantium Infernalium, and the great Decayed. Impressive resume nevertheless. Introduce a bit of Ironsword’s history for those who don’t know it yet. I hope it will clear up everyone in just a few lines, oh well, let’s try… Ironsword is a power Metal band formed more or less in late ’94, and it’s completely inspired by old Metal 80’s bands like Manilla Road, Manowar, Saxon, Maiden, Priest, Running Wild, etc. It was supposed to start in early’89 under a different name, with line-up etc., but it took me all this time to recover, and put myself on the right track again. In between I have played in other bands, which helped to delay the real beginning of Ironsword. I am the only member, I released in late ’95 a 3 song promo tape that received good feedback… that’s basically the history of Ironsword so far, so there is not much to tell! So, Ironsword is a one-man band. Don’t you find that it’s quite difficult to be the one who handles all the instruments? Why do Ironsword is a one-man band? Do you try to make it that way or planning to get some new members soon? I think chances of playing live are rather slim too for a one-man band. In this era of the ‘awakening of black Metal’, it’s quite refreshing to hear a band that plays a different concept. So Tann, why did you choose to play power Metal? You’ve started Ironsword for about 6 years before you finally unleashed the promotape to the public. Why did you take such a long time before you start promoting Ironsword? You claimed that Ironsword plays Lusitanian Metal, what is it, really? “Lusitanian” literally means the inhabitants, tribes of pre-Celtic origin which lived in Portugal, formerly known as Lusitania, in the Iron Age period. They were known as the Lusitanians. Some people still use this word to describe something mythological, immemorial, epic… so it makes sense to label my music as pagan power Metal or just Lusitanian Metal, since I come from Portugal, I was the first as well to come up with this label even when I was playing in other bands and everything in Ironsword is connected with this side of Portuguese historical background. What about your lyrics then? I think you take your national culture seriously, Tann. What is the connection between your eternal belief and your songs? I’ve been studying for quite a while the past of my national culture, and it makes me very proud to know the glorious history of my pagan forefathers, it’s something of high interest I consider very important because I do feel personally linked with that period of history, I’m still Lusitanian though blood and soil. It’s like if I belonged to that period. The band is just a way to express the knowledge, to put me closer to this matter. Unfortunately, nowadays people don’t care for old values, for their own history etc. They care more for materialism than knowing more about their lives, their history. Your influences comprise of old Metal bands like Manowar, Bathory, etc. Don’t you have any new ones which you liked the music? What do you think about the extreme Metal scene of today compared to the early days? I just like what I feel that is good music, so that’s why I only like 80’s Metal bands mostly! Besides, I like classical music, especially Wagner. Of course I like as well some new bands, those which I’m in contact with, friends of mine, like Cruachan, In The Woods…, etc. Well, they know who they are, so I don’t need to tell the interviews. Hail and Kill to all of you in case you read this! As for the other questions you made, I guess you can compare the musical evolution and progress with other expressions of art. Since we are heading to a position that soon there will be nothing left to invent, while some bands follow the trends, others have to search for new things to sound original for how strange it may seem for your ears, so that’s why the whole thing is becoming so senseless. There’s no Rock n’ Roll spirit anymore! Just pure materialism, music for profit etc.! “Ironsword music is full of strong feelings and atmosphere.” What are the feelings you’re talking about? Longing for my homeland, for a noble life with honour, glory and pride, battles fought for freedom, to be one with nature etc. Those are the feelings I’m talking about. Some people confine to the thought that says by singing in their own language will give some extra plus points. So why don’t you sing in your own mother tongue, Tann? Do you agree with such opinion like above? To tell you the truth, I’ve thought of that previously, but I realized that people would not understand the lyrics and what I was singing, except maybe for Portuguese people that are familiar with. I agree it may give more atmosphere if you sing in your mother tongue, making it more mysterious, mystical, ancient etc. but on the other hand there’s always the problem that only a few could understand and it can cause lack of interest before others. I think anyone can do whatever he wants! Perhaps I will do in the future a couple of lyrics in Portuguese or Latin, but nothing’s sure yet. We shall see if it works! Any upcoming releases from Ironsword soon? Is the demo “Power Metal Thunder” had been released? What about some poetic words a s a closing for this interview? Well, I’m listening to Virgin Steele, honestly I don’t feel too inspired to write poetry, but I can write something like “Hard n’ Heavy on Metal, Raise the fist of the Metal child, Iron, leather and Metal is the law, Under the sign of Metal we fight!”. Hail and Kill!